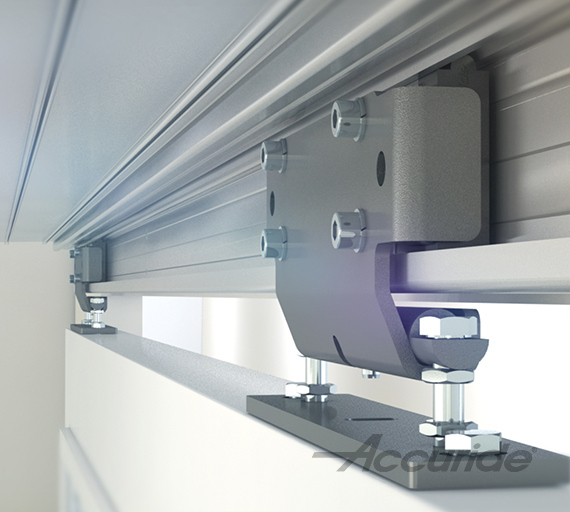 The 116RC heavy-duty linear track system from Accuride is said to deliver smooth, ADA-compliant linear motion to heavy-duty applications, including large screens, panels, movable walls and barn doors. The system includes a corrosion-resistant aluminum track and a cartridge with recirculating steel or polymer ball bearings. aluminum track in 94.5 and 142 in. lengths. Tracks can be cut or butted together to adjust length, and re-circulating ball carriages come with either stainless steel (for greater load) or polymer (for quiet movement) ball bearings. The system supports multiple carriages per track and units can be fitted for sliding doors.